Will received a congratulations letter from Governor Jodi Rell the other day. She’s designated this Saturday (April 5) as William Joseph Schmitt Day in the State of Connecticut. Nice touch. So far, he’s received congratulations letters from a number of other folks, as well, including Representative Shays, Senator Dodd, Barack Obama, George and Laura Bush and others (even the New York Jets). In a sense, these are political/PR, but I think they also indicate the level of accomplishment that is represented by the Eagle Award. With all the craziness in the world, these letters are recognizing the confidence we have in these boys as they become men. The hard work these boys do to reach this goal should be recognized. Whether people can all agree with the individual rules and restrictions that the Boy Scouts embrace, the overall goal of the program is still to turn good kids into good men. We need more of those, and William Joseph Schmitt Day recognizes the importance of that. Last night, Will had his Board of Review with the Council. It went off well, and the board told him that he was one of the most prepared candidates they had seen. Congratulations were passed all around, and it’s now down to the paperwork being submitted to the National Headquarters. It was a long process, and one that he should be proud of. 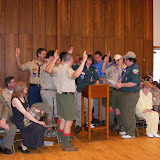 The thing about becoming an Eagle Scout is that it is an accomplishment that a scout does on his own. Parents may do a little nudging from time to time, but the entire process is driven by the candidate himself. It’s not our accomplishment, it’s his. At the end of the review, one of the men who sat on the board who had attained Eagle himself told him that he takes the process very seriously, and was extremely pleased to welcome him to the ranks of Eagle Scouts. He also said that Eagle is the one rank in scouting that doesn’t go away when you reach the maximum age to be a youth member of the Boy Scouts. Once a person becomes an Eagle Scout, they are always an Eagle Scout. It’s a tremendous accomplishment, and one that he will carry with him throughout his life. And he earned it himself. Well, it appears that my son, Will, is almost done. Earlier this week, I wrote my own personal recommendation for him and others are coming. Writing it was a lot harder than I expected. It’s difficult to write about your own child without just sounding like a parent. Beyond that, he seems to have all his merit badges and paperwork in order. He brings it to a Troop meeting next week, and then to the Council at the end of the month for the Board of Review. If they approve all of his prerequisites and the completion of his project, the package goes on to National Headquarters for final approval. It’s amazing. Not counting all the advancements before this, but counting the process of determining just what he wanted to propose for his project and working out what the logistics would be, he’s been on this for well over a year. It’s nice to see that kind of commitment. Hopefully, he’s nearing the end of that road. The BOE accepted the project last week and kids have been using the playscape beginning a few days later (it rained right after it went up, so they had to wait!). A friend who is a teacher say they love it. Will’s been swamped, but will be updating details with his own comments later. Meanwhile, click on the picture to see the album of these shots…. Approvals have been received, and last night the fence came down. The pictures in the album that the picture to the left are linked to were taken with a cell phone camera after it was getting dark, but we wanted to get something to post. Better pictures will be coming in the next day or so. Yesterday, while we were at the school working on the project, a small boy came by. Actually, he was hiding behind one of the bushes watching us until we told him that we could see his legs under the bush. Once he came out, he was very talkative. It was very interesting. 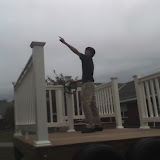 He told us that he thought the first graders would really enjoy the new playset and that he knew that because he used to be a first grader at the school and that the first grade playground was the only one at the school that had nothing to play on. That, of course, was what Will remembered from when he was at the school and a reason he chose to do this particular project. 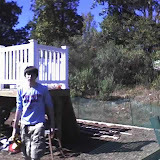 I told the boy that and that it Will’s Eagle Project. That got him talking about how he was a Cub Scout and how he would like to do a project like that when he became a Boy Scout. It turned out he was in Pack 60, which is where Will started before switching to Pack 65 and then moving up to Boy Scouts. If he stays with it, he’ll end up in the same troop as Will (60 doesn’t have a troop). That would be after Will is too old to remain in the troop as a Scout, but another interesting set of coincidences. After a while, he was joined by another kid about the same age, who was also a Cub Scout, and a little girl named Emily who was one of their sisters (I didn’t get which) and about the right age to be in First Grade. The second boy had much the same comments as the first. The little girl really wanted to play on the playset, but when she approached we had to tell her that she had to wait because the EPL was wet and it needed to pass inspection first. She turned away, but was clearly very disappointed. All three of them were looking forward to playing on it. The light at the end of the tunnel. Will put the EPL coating on the ladder, rim joists, and anything else that the kids might be having regular contact with, tightened up some screws, hung the climbing wall, cut off any protruding bolts, and generally cleaned up. 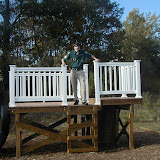 On Saturday, September 15, several of the Boy Scout Staff from Camp Strang and their parents came to help. Dirt was filled in on the outside of the box where it had been removed during the excavation, rails and posts were completed, and the steering wheel was installed. More details will be added by Will later. You are currently browsing the archives for the 'Eagle Project' category.